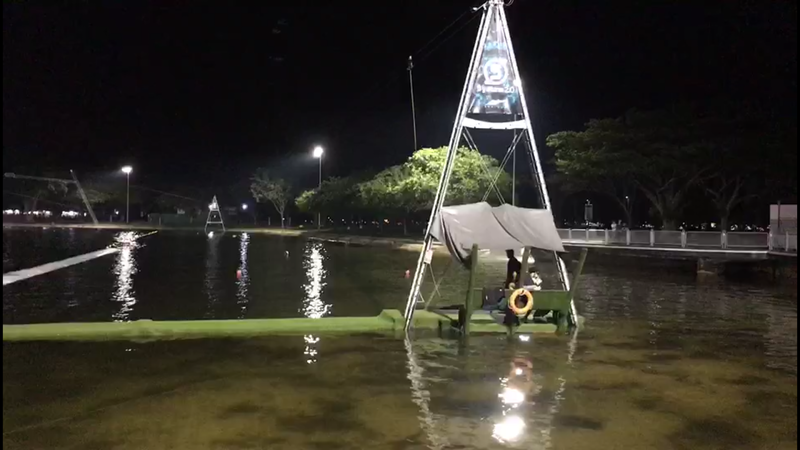 Formally known as Ski360, now managed by the Island Lifestyle Group, it’s Singapore’s only cable-ski park that offers the thrill from ages of 10 to seniors in their 50s (assessment based on individual’s water competence and general fitness level), includes wakeboarding and water skiing that is in a safe enclosed body water. Located in the lagoon of East Coast park, this place has attracted the interest of many who are interested in finding new activities to do. But before that, currently they are running a promotion. 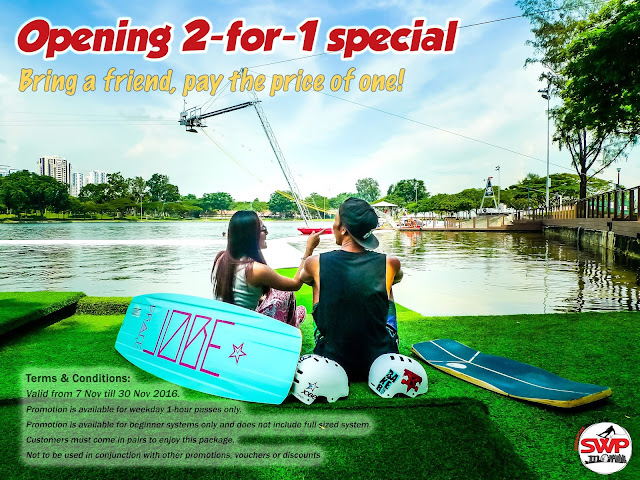 From now till 30th November, 2 person are entitled for the price of one. Terms and conditions apply. Opened throughout the week, both in daytime and night time, this revamp place has a full-sized cable system and two System 2.0s (Suitable for beginners and novice riders). A person that is introductory of this sport are most welcome as the instructors will guide you through the process. In other words, putting fear aside and bring your inner self of confidence to conquer different kind of challenges. Getting to the place is easy, whether from taking bus, train, car or whichever mode of transport where you come from, especially bicycles (since it’s East Coast park), the place has a unique designated area. From Bedok, you have to take a bus to reach to the destination. It’ isn’t far and preferably service 197. Dropping off at Laguna park, take a walk and pass by Victoria School, upon seeing the expressway, walk straight towards the underground passageway. Another service 401 only operate during the weekend which will bring directly to the bus stop nearer. Only operate during the weekend. By Car or taxi, going through ECP highway, exit 7A and take the Laguna Flyover into East Coast Park Service Road. 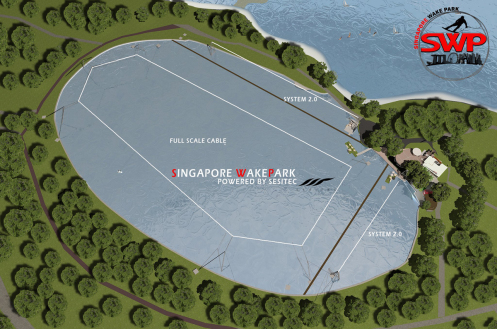 Park at Car Park E1 and walk 500m to Singapore Wake Park. Upon reaching, you’ll be greeted by the friendly people at the shop. Whereby purchases have to be made first before getting to the water. But before beginning the ride, you'll require to sign a Liability Waiver Form. Remember to bring along your identification card for verification purposes. After that, getting change is easy as there are toilet and shower facility with locker storage at your convenience. Do remember bring your own personal lock or you can buy from there from $3 per lock. The park also offers many complementary facilities and services including free wireless connectivity. It is advisable to dress comfortably for being in the water for a period of time. Do also bring a towel and a change of clothes. You'll be given a life vest, which is extremely well build quality and a helmet. This section offers the fundamental knowledge on how to cable ski when you’re first timer. This system is great for anyone from learning to kneeboard or stand on the wakeboard. Section A was practically easy, lining up your position and knowing the posture on how to start off. The sitting start was most comfortable for me. Best of all, you can take your time to learn as this is only one person at a time hence creating a safe learning environment whereby the instructor focuses only on one rider each time. The speed is adjustable, which makes leaning how to stand on a wakeboard easier, and it also means gentle falls. Perfect for young children and those just starting out on the wakeboard. Section B - This is where you'll be levelling up. Teaches how to deep water start in case you accidentally fall inside the water and doing a figure of '8'. Basically, it's the manoeuvring turns. Based on my experience, first try out wasn’t as easy. But throughout on trying again, it was a joy to be riding again and again. Till the time you didn’t notice, you are having fun. I have been lost of words by how incredible this new sport for me. If you have what it takes from the two sections, then it's time to bring in the challenge to the next level. Key features include 6 towers and 6 evenly-spaced carriers, advanced sensor technology and environmentally-friendly cable system. There's a max capacity of 6 riders at each time. I didn't manage to ride on this system as mostly were spend time on System 2.0. What I was told is that this is much faster to anticipate and uses a much more thicker wire. They adding obstacles in the full size cable system soon in the near future such as (Kickers, Box, Rail, Grom Table, Pipe). Hungry for an appetite? Coastal Rhythm got you covered. If you are feeling hungry or accompany someone at this place, they have a café and bar. Coastal Rhythm serves up international and local cuisine for both the public and park visitors. The food place has a seating capacity from 80 - 100. Opening hours from 10am - 11pm on Mon - Thurs (last food order at 930pm), Fridays and Eve of Public Holidays, 10am - 1am (last food order at 1030pm), Saturdays, 9am - 1am (last food order at 1030pm), Sundays and Public Holidays, 9am - 11pm (last food order at 930pm). Do note that their full menu course are available from 11am onwards. During operational hours, sandwiches and snacks are available.